Some trends are just so hot hot hot, and wristbands are one of 'em! 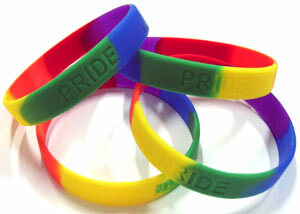 Now you can join in on the fun and show your pride with this Rainbow Pride Wristband. They're so affordable, and the more you order, the more you save. At this price, you can afford to order one for everyone you know. Trust us, they'll thank you for helping them be a trendsetter! Purchase is for (1) bracelet - unless multiple quantities are ordered.